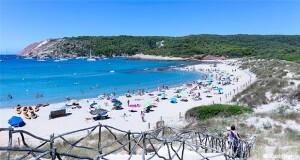 The holiday resort Son Bou is centrally located on the south coast of Menorca. The distance to the capital, Mahon, is approx. 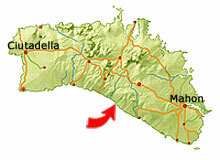 20 km and the travelling time from the airport is usually not more than 30 minutes. 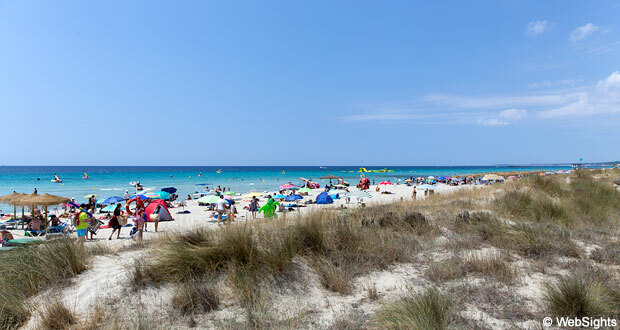 With its 2.4 kilometres, the beach in Son Bou is the longest sand beach in Menorca. The beach is completely covered with very fine-grained sand. The water is crystal clear, has beautiful turquoise shades and only deepens slowly. This is one of the reasons why Son Bou is popular among families with small children. 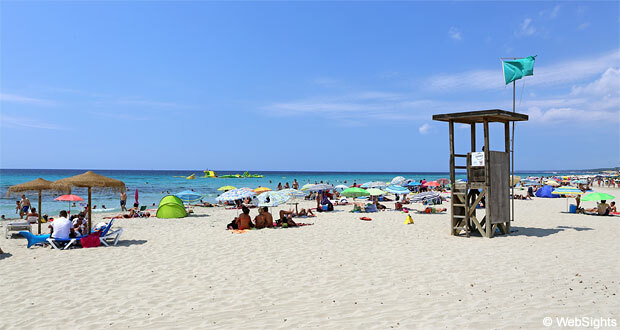 The beach has all the usual facilities, such as sun lounges, sunshades, toilets and showers. During the high season, the beach is supervised by lifeguards. A few minutes on foot from the beach, there is a giant parking space, where you can park for free. 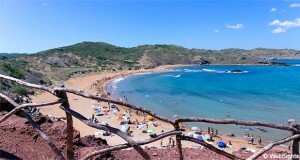 Behind the beach, you will find the largest dunes in Menorca as well as some interesting wetlands. This area is protected, and therefore the hotels are not built right next to the beach in Son Bou. The beach has plenty of room in the fine-grained sand and shallow water, which makes the beach perfect for children. If the wind comes from the south and south-west, there may be big waves and undercurrents. 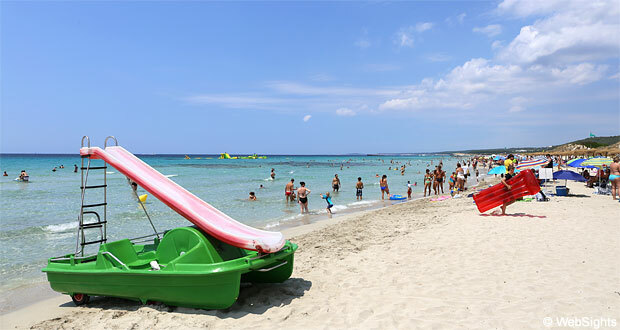 You will find a few water sports activities at the beach, including banana boat and water bikes. 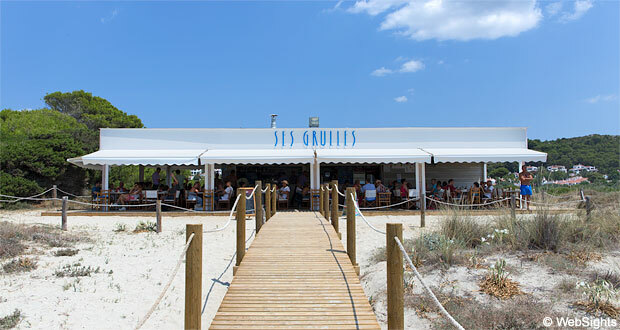 Right behind the beach, there are three relatively large restaurants with a fine selection. Here it is also possible to buy food, ice cream and refreshments to bring to the beach. Son Bou is actually made up of three adjoining holiday resorts. The two other holiday resorts are San Jaime and Torre Soli Nou, but in travelling guides such as this one, the entire area is usually referred to as Son Bou. Son Bou is established as a holiday resort and most of the town is made up of charming private holiday homes with swimming pools. Many of these can be rented and the town also has 12-15 hotels. Due to the large preserved area, only one of these hotels is located next to the beach: the Sol Milanos Pingüinos hotel. The central attraction is the centre that surrounds the round bowling alley. The centre mostly consists of restaurants, cafés and bars, but there are also a few tourist shops and a supermarket. If shopping is on the agenda, you should go to the capital, Mahon. Here you can easily spend a day with shopping, a tour in the historical quarters, boat trips and great food in one of the many restaurants. The ’real’ Son Bou is located in the southeast corner, where you will also find the centre and most of the restaurants/shops. The large parking space behind the beach is also clearly visible on the map. 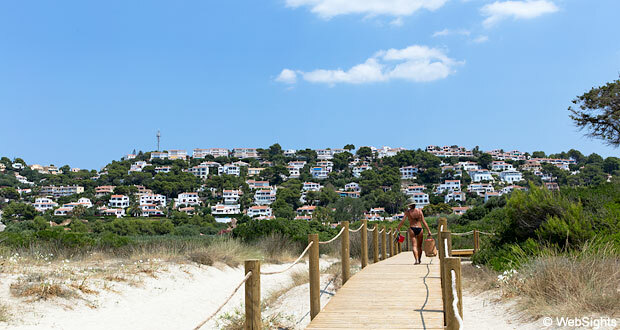 A few kilometres north-west of the town, you will find the holiday resort Sant Tomas, which is slightly smaller.